UNITED NATIONS, Oct 22 2013 (IPS) - The tiger population in the rainforests of Sumatra is vanishing at a staggering rate, reducing the number of the endangered species to as few as 400, warns Greenpeace International. The primary reason is the expansion of oil palm and pulpwood plantations, which are responsible for nearly two-thirds of the destruction of tiger habitat from 2009 to 2011, the most recent period for which official Indonesian government data are available. In a new study released Tuesday, Greenpeace says such destruction fragments the extensive tracts of rainforest over which tigers need to range in order to hunt. The decline of Sumatran tigers is a measure of the loss of rainforest, biodiversity and also climate stability, according to the study titled ‘Licence to Kill’. This summer, huge fires, both accidental and deliberate, raged across the Sumatran province of Riau, destroying hundreds of thousands of hectares of rainforests – including the deep peatland forests that are a last stand of tiger habitat in the province. The fires released record amounts of greenhouse gas (GHG) emissions and pollutants in a haze that stretched as far as Thailand. There are no estimates as to how many tigers have been killed so far, although the figure could be in the thousands over the last decade. Asked whether the United Nations is engaged in the protection of tigers, Bustar Maitar, the Indonesian head of Greenpeace’s Forest Campaign and Global Forest Network, told IPS, “I don’t see much U.N. activity on forests. He said REDD was working closely with its Indonesian counterpart to accelerate REDD projects in Indonesia. Maitar also said the U.N.’s focus is more on general sustainable development and democracy in Indonesia than on protecting the tiger, described as a critically endangered species. “Or they might not really be clear as to how to fit in with this issue in Indonesia,” he said, adding that the U.N. could provide more technical assistance and capacity building for government and civil society. The U.N. REDD programme was launched in 2008 and encompasses the technical expertise of UNDP, the Food and Agriculture Organisation (FAO), and the U.N. Environment Programme (UNEP). It supports nationally-led REDD+ processes and “promotes the informed and meaningful involvement of all stakeholders, including indigenous peoples and other forest-dependent communities, in national and international REDD+ implementation“, according to the United Nations. Currently, about 85 percent of Indonesia’s GHG emissions typically come from land-use changes (principally related to deforestation for plantations or agriculture), and around half of this is peat-related. Even Sumatran tiger habitat in protected areas such as the world-famous Tesso Nilo National Park has been virtually destroyed by encroachment for illegal palm oil production, and government officials acknowledge that protection for such areas exists only on paper, says Greenpeace International. The study also points out that forested tiger habitat in licenced plantation concessions has no protection at all. 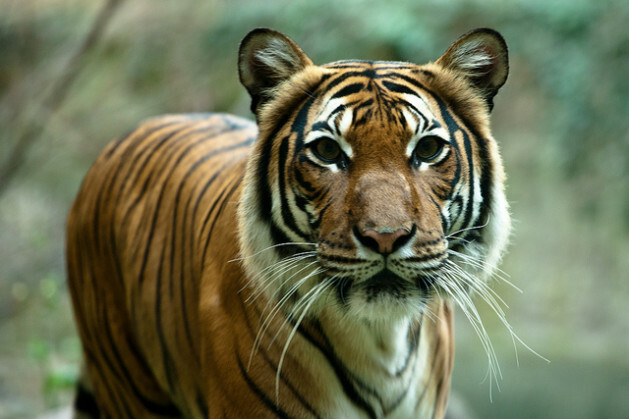 One million hectares – 10 percent of all remaining forested tiger habitat – remained at risk of clearance in pulp and oil palm concessions in 2011. Over the 2009-2011 period, pulpwood suppliers were responsible for a sixth of all forested tiger habitat loss. And during the same period, the palm oil sector cleared a quarter of the remaining tiger habitat in its concessions. “These failures expose how unregulated and irresponsible expansion, notably of oil palm and pulp wood plantations, undermines the Indonesian government’s commitments to stop deforestation and to save the tiger and other endangered wildlife,” the study says. Greenpeace also says its investigations have revealed that household names, including Colgate Palmolive, Mondelez International (formerly Kraft), Nestle Oil, Procter & Gamble, Reckitt Benckiser and a host of other companies are linked to Singapore-based Wilmar International Ltd and its international trade in dirty palm oil. Wilmar is the world’s largest palm oil processor, accounting for over one-third of the global palm oil processing market and with a distribution network covering over 50 countries. U.N. Secretary-General Ban Ki-moon points out that forests are vital for human well-being. In a message for the International Day of Forests last March, Ban said forests cover nearly a third of the globe and provide an invaluable variety of social, economic and environmental benefits. Three-fourths of freshwater comes from forested catchment areas. Forests stabilise slopes and prevent landslides, while also protecting coastal communities against tsunamis and storms. More than three billion people use wood for fuel, some two billion people depend on forests for sustenance and income, and 750 million live within them, he added. Ban also said forests are often at the frontlines of competing demands. Urbanisation and the consumption needs of growing populations are linked to deforestation for large-scale agriculture and the extraction of valuable timber, oil and minerals. Often the roads that provide infrastructure for these enterprises ease access for other forest users, who can further exacerbate the rate of forest and biodiversity loss. “We need now to intensify efforts to protect forests, including by incorporating them into the post-2015 development agenda and the sustainable development goals,” Ban noted. “I urge governments, businesses and all sectors of society to commit to reducing deforestation, preventing forest degradation, reducing poverty and promoting sustainable livelihoods for all forest-dependent peoples,” he said. we really need to do all we can to preserve our wildlife and take action as soon as possible before these animals become exctinct forever.